370 pages | 44 Color Illus. | 102 B/W Illus. This informative volume discusses recent advancements in the research and development in synthesis, characterization, processing, morphology, structure, and properties of advanced polymeric materials. 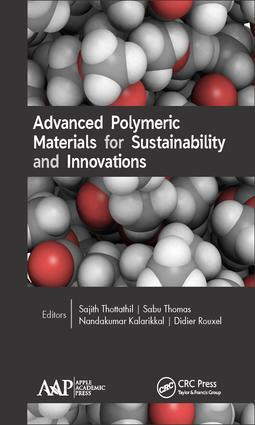 With contributions from leading international researchers and professors in academic, government and industrial institutions, Advanced Polymeric Materials for Sustainability and Innovations has a special focus on eco-friendly polymers, polymer composites, nanocomposites, and blends and materials for traditional and renewable energy. In this book the relationship between processing-morphology-property applications of polymeric materials is well established. Recent advances in the synthesis of new functional monomers has shown strong potential in generating better property polymers from renewable resources. Fundamental advances in the field of nanocomposite blends and nanostructured polymeric materials in automotive, civil, biomedical and packaging/coating applications are the highlights of this book. Nandini R. and Vishalakshi B.
Sajith Thottathil, MTech, is an Assistant Professor at the International and Inter University Center for Nanoscience & Nanotechnology, Mahatma Gandhi University, Kottayam, Kerala, India. He was previously a research scholar at the same university. He completed his BTech degree in mechanical engineering from Kerala University, India, and went on to earn his MTech in nanotechnology from the National Institute of Technology, Kerala, India. His research areas include nanotechnology, mechanical engineering, and polymer nanocomposites. Sabu Thomas, PhD, is the Pro-Vice Chancellor of Mahatma Gandhi University and Founding Director of the International and Inter University Center for Nanoscience and Nanotechnology, Mahatma Gandhi University, Kottayam, Kerala, India. He is also a professor of polymer science and engineering at the School of Chemical Sciences of the same university. He is a fellow of many professional bodies. Professor Thomas has (co-)authored many papers in international peer-reviewed journals in the area of polymer science and nanotechnology; his H index is 81. Nandakumar Kalarikkal, PhD, is an Associate Professor of Physics at the School of Pure and Applied Physics, as well as the Joint Director of the Centre for Nanoscience and Nanotechnology, Mahatma Gandhi University, India. Dr. Kalarikkal’s research center has established state-of-art experimental facilities that cater to the needs of researchers within the country and abroad. Dr. Kalarikkal has received several awards and has edited books with colleagues. Didier Rouxel, PhD, is currently Professor at the Université de Lorraine, Nancy, France, and he leads the Micro and Nano Systems Team at the Institut Jean Lamour, also in Nancy, France. He was expert for the French agency ANSES for the topic “Nanomaterials and Health” and was proclaimed Member of the Year of the French Society of Nanomedicine in 2014.